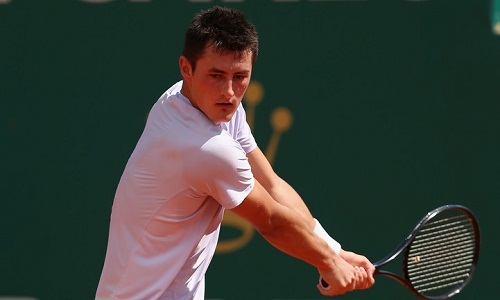 Australian star Bernard Tomic was among the early winners of the ATP Monte Carlo Masters, the main draw of which got underway on Sunday in Monaco. Tomic, currently ranked 26th in the world, rallied from a set down to sneak a hard-fought 4-6 6-2 6-3 win over Czech Republic’s Lukas Rosol in the opening-round encounter that lasted for 90 minutes. Up next, Tomic will either face 13th-seeded Latvian Ernests Gulbis or Austrian Andreas Haider-Maurer in the second round. 34-year-old Victor Estrella Burgos also advanced to the second round of the tournament, following a 6-4 7-6 conquest of Italian Simone Bolelli. Germany’s Florian Mayer shrugged off a tricky first set to clinch a 7-6 6-4 victory against Russian journeyman Mikhail Youzhny in the other first-round match up.